I love trees. I think they are my favorite life-form after humans. In college I had the opportunity to plant many trees as part of an environmental project. These were small seedlings about 6-12 inches in size – helpless twigs that were vulnerable to lawnmowers, deer, foot-traffic and a host of other environmental factors. The ones that survived transformed into behemoth entities that would provide shade for people, sanctuary for animals and even entertainment for young climbing children. Planting and caring for trees gave me a new-found appreciation for our symbiotic friends. Nurturing a tree is akin to launching or growing a business. It starts small – a thought, an idea, which slowly takes root. When conditions are right, a stem (product) emerges and leaves (clients) begin to form. At first, the business is very fragile. Growth (your enthusiasm and momentum) can easily be crushed by a host of factors including, lack of funding (not enough water or sunlight), competition (weeds and crowded roots) or bad market conditions (infertile soil). It is critical to stay focused (weed and fence). It helps protect your zeal from cynics (mowers) and other distractions (wildlife). If you create a desirable and unique product (seek open spaces) and benefit from favorable conditions (healthy soil, a positive attitude, and a little luck) your business (tree) will likely take root, grow and flourish. It is immensely gratifying to see a sapling reach maturity and I think the entrepreneurial process is much the same. Sure, there is risk and heartache, but as you witness it progress and expand, you sit in amazement remembering how it all started – with a small, yet potent seed. The tree allegory can be extended further to include other elements such as branches (product lines), pruning (keeping what works), fruits (profit) and spreading new seeds (continuous innovation). But, I think I’ll save those points for a future post. 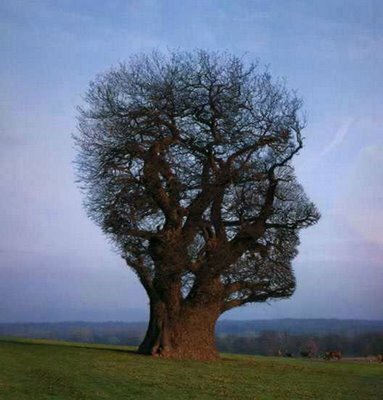 Do you think trees are good metaphor for entrepreneurship and can you suggest any others?